Maravilloso! Fantastique! Sugoi! Wunderbar! 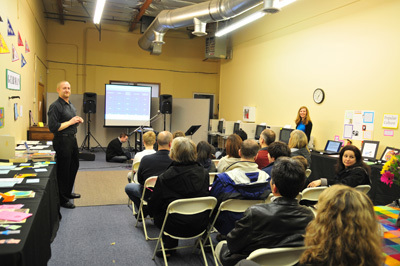 Chrysalis High School held their first ‘World Languages Night’. 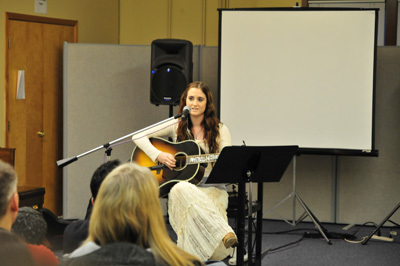 Over 60 people attended the evening filled with amazing food, song and crafts. 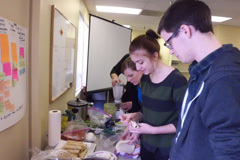 The Spanish students spent two days before the event preparing homemade regional cuisine. The night of the event there were additional dishes to enjoy like black bean and chicken taquitos, horchata to drink, chicken mole, goulash and two different types of salsas to savor and devour! Not only was the food superb, but the talent was as well! 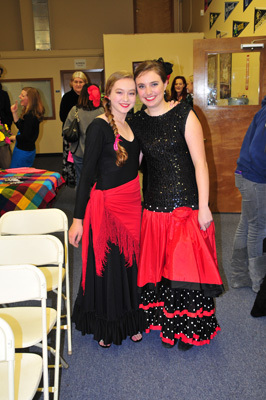 Sara and Fiona modeled traditional flamenco-style costumes and Zach played Spanish guitar. Amanda graced the stage with a lovely Spanish lullaby, and Zane and Kyle performed a fun rap song completely in Spanish! The room was filled with beautifully designed artwork and crafts from Germany and Japan, France as well as Mexico and Spain. Everyone who attended had a wonderful time talking, eating and exploring how hard our students work to learn and experience not just the words but the cultures of the languages they are studying. Thanks to Alison for organizing the food making, John for his delicious tortillas, mole and participation in ‘Jeopardy’ as well as Kari and Eric for their German, Japanese and French connections! Most of all, thanks to all the parents and students who participated and shared their experiences, it made the evening both educational and entertaining.